A 44 year old woman presented to the Emergency Department with severe sudden onset pelvic pain. A Pelvic Ultrasound revealed a large multifibroid uterus. The largest fibroid was pedunculated and was 80mm. It is likely that this fibroid twisted (torted). There were several other fibroids ranging from 4cm to 6cm. She underwent Total Laparoscopic Hysterectomy. 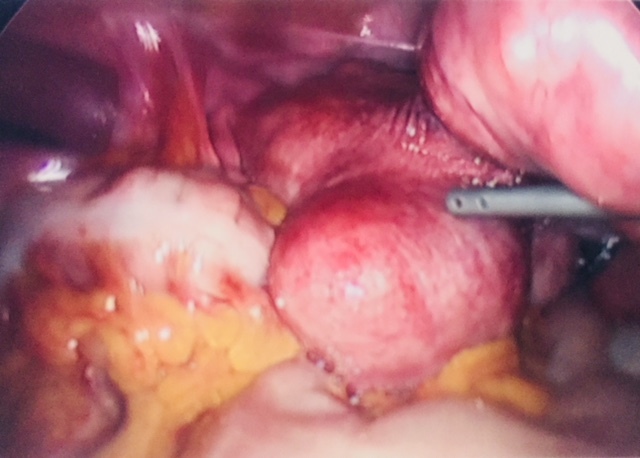 The laparoscopic view of the uterus showing multiple fibroids. In particular, there is a right sided pedunculated fibroid. The pedunculated fibroid is removed - myomectomy. The stalk is bipolared and divided. This allows access to the uterus to perform the hysterectomy. The pedunculated fibroid is attached to the body of the uterus via a stalk. It is likely that the stalk twisted and this caused the sudden onset of severe pelvic pain.